Fill in the blank: One key word that should always send up a red flag to all of us who care about animals is “_______________”. . . . When I hear that word, I know for sure that there is some sort of hunting, fishing, trapping, etc., involved . . . The correct answer is “conservation”. Conservationists, in their efforts to save the world’s species, sometimes, need to capture, translocate, cage, injure and even kill individual animals. Not surprisingly, these actions raise the hackles of animal rights and welfare groups – such as People for Ethical Treatment of Animals (PETA), from whose website1 the above lines were taken – whose aim is to protect the rights of every single individual animal. 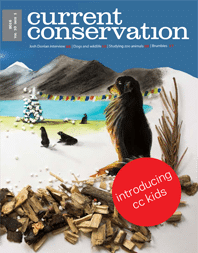 The articles in this edition of CC all deal with the thorny issue of animal rights in conservation: should we eradicate invasive animals from islands? How should we deal with stray dogs that attack wildlife in the Trans- Himalayas? Or feral horses that destroy natural vegetation in Australia? Do zoo animals have a role in conservation?